Elbow joint replacement (also called elbow arthroplasty) can effectively treat the problems caused by arthritis of the elbow. The procedure is also becoming more widely used in aging adults to replace joints damaged by fractures. The artificial elbow is considered successful by more than 90 percent of patients who have elbow joint replacement. The elbow joint is made up of three bones: the humerus bone of the upper arm, and the ulna and radius bones of the forearm. The ulna and the humerus meet at the elbow and form a hinge. This hinge allows the arm to straighten and bend. The large triceps muscle in the back of the arm attaches to the point of the ulna (the olecranon). When this muscle contracts, it straightens out the elbow. The biceps muscles in the front of the arm contracts to bend the elbow. Inside the elbow joint, the bones are covered with articular cartilage. Articular cartilage is a slick, smooth material. It protects the bone ends from friction when they rub together as the elbow moves. Articular cartilage is soft enough to act as a shock absorber. It is also tough enough to last a lifetime, if it is not injured. The connection of the radius to the humerus allows rotation of the forearm. The upper end of the radius is round. This round end turns against the ulna and the humerus as the forearm and hand turn from palm down (pronation) to palm up supination). What makes elbow joint replacement surgery necessary? A joint replacement surgery is usually considered a last resort for a badly damaged and painful elbow joint. The artificial joint replaces the damaged surfaces with metal and plastic that are designed to fit together and rub smoothly against each other. This takes away the pain of bone rubbing against bone. The most common reason for an artificial elbow replacement is arthritis. There are two main types of arthritis, degenerative and systemic. Degenerative arthritis is also called wear-and-tear arthritis, or osteoarthritis. Any injury to the elbow can damage the joint and lead to degenerative arthritis. Arthritis may not show up for many years after the injury. There are many types of systemic arthritis. The most common form is rheumatoid arthritis. All types of systemic arthritis are diseases that affect many, or even all, of the joints in the body. Systemic arthritis causes destruction of the joints’ articular cartilage lining. An elbow joint replacement may also be used immediately following certain types of elbow fractures, usually in aging adults. Elbow fractures are difficult to repair surgically in the best of circumstances. In many aging adults, the bone is also weak from osteoporosis. (People with osteoporosis have bones that are less dense than they should be.) The weakened bone makes it much harder for the surgeon to use metal plates and screws to hold the fractured pieces of bone in place long enough for them to heal together. In cases like this, it is sometimes better to remove the fractured pieces and replace the elbow with an artificial joint. You may also need to spend time with the physical or occupational therapist who will be managing your rehabilitation after surgery. This allows you to get a head start on your recovery. One purpose of this pre-operative visit is to record a baseline of information. Your therapist will check your current pain levels, ability to do your activities, and the movement and strength of each elbow. A second purpose of the pre-operative therapy visit is to prepare you for surgery. You’ll begin learning some of the exercises you’ll use during your recovery. And your therapist can help you anticipate any special needs or problems you might have at home, once you’re released from the hospital. On the day of your surgery, you will probably be admitted to the hospital early in the morning. You shouldn’t eat or drink anything after midnight the night before. Come prepared to stay in the hospital for at least one night. What happens during an elbow replacement surgery? Replacement surgery is usually not considered until it has become impossible to control your symptoms without surgery. If replacement becomes necessary, it can be a very effective way to take away the pain of arthritis and to regain use of your elbow. Before we describe the procedure, let’s look first at the artificial elbow itself. There is more than one kind of artificial elbow joint (also called a prosthesis). The most common types are like a hinge. Each prosthesis has two parts. The humeral component replaces the lower end of the humerus in the upper arm. The humeral component has a long stem that anchors it into the hollow center of the humerus. The ulnar component replaces the upper end of the ulna in the lower arm. The ulnar component has a shorter metal stem that anchors it into the hollow center of the ulna. The hinge between the two components is made of metal and plastic. The plastic part of the hinge is tough and slick. It allows the two pieces of the new joint to glide easily against each other as you move your elbow. The hinge allows the elbow to bend and straighten smoothly. A cemented prosthesis uses a special type of epoxy cement to glue it to the bone. An uncemented prosthesis has a fine mesh of holes on the surface. Over time, the bone grows into the mesh, anchoring the prosthesis to the bone. Most elbow replacement surgeries are done under general anesthesia. General anesthesia puts you to sleep. In some cases surgery is done with regional anesthesia, which deadens only the nerves of the arm. If you use regional anesthesia, you may also get medications to help you drift off to sleep, so you are not aware of the surgery. After the anesthesia, the surgeon makes an incision in the back of the elbow joint. The incision is made on the back side because most of the blood vessels and nerves are on the inside of the elbow. Entering from the back side helps prevent damage to them. The tendons and ligaments are then moved out of the way. Care must be taken to move the ulnar nerve, which runs along the elbow to the hand. Once the joint is exposed, the first step is to remove the joint surfaces of the ulna and the radius. This is usually done with a surgical saw. The surgeon then uses a special rasp to hollow out the marrow space within the ulna to hold the metal stem of the ulnar component. The ulnar component is then to test the fit. If necessary, the surgeon will use the rasp to reshape the hole in the ulna. When the ulnar component has been fitted correctly, the surgeon repeats the procedure on the humerus. After the humeral component has been fitted, the surgeon puts together the pieces of the implant and checks to see if the hinge is working correctly. The implant is then removed, and the bone is prepared to cement it in place. The pieces are cemented in place and put together. After another check for proper fit and motion, the surgeon sews up the incision. Your elbow will probably be placed in a bulky dressing and splint. You will then be awakened and taken to the recovery room. Does elbow replacement surgery cause any problems? Infection following joint replacement surgery can be very serious. The chances of developing an infection after most artificial joint replacements are low, about one or two percent. Elbow replacement has a somewhat higher chance of infection, for many reasons. The skin is thin around the elbow, and no muscles cover the joint. This makes wound complications more common. 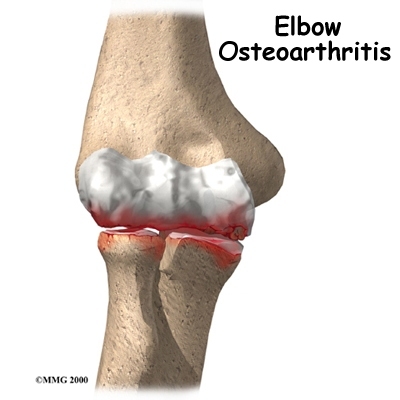 Elbow replacements are also done more often in people who have rheumatoid arthritis. This disease and the drugs used to treat it affect the body’s immune system, making it harder to fight off infections. Sometimes infections show up very early, before you leave the hospital. Other times infections may not show up for months, or even years, after the operation. Infection can also spread into the artificial joint from other infected areas. Once an infection lodges in your joint, it is almost impossible for your immune system to clear it. You may need to take antibiotics when you have dental work or surgical procedures on your bladder and colon. The antibiotics reduce the risk of spreading germs to the artificial joint. The major reason that artificial joints eventually fail is that they loosen where the metal or cement meets the bone. A loose joint implant can cause pain. If the pain becomes unbearable, another operation will probably be needed to fix the artificial joint. There have been great advances in extending the life of artificial joints. However, most implants will eventually loosen and require another surgery. Younger, more active patients have a higher risk of loosening. In the case of an artificial knee joint, you could expect about 12 to 15 years, but artificial elbow joints tend to loosen sooner. All of the large nerves and blood vessels to the forearm and hand travel across the elbow joint. Because surgery takes place so close to these nerves and vessels, it is possible to injure them during surgery. The result may be temporary if the nerves have been stretched by retractors holding them out of the way during the procedure. It is very uncommon to have permanent injury to either the nerves or the blood vessels, but it is possible. After surgery, your elbow will probably be covered by a bulky bandage and a splint. Depending on the type of implant used, your elbow will either be positioned straight or slightly bent. You may also have a small plastic tube that drains blood from the joint. Draining prevents excessive swelling from the blood. (This swelling is sometimes called a hematoma.) The draining tube will probably be removed within the first day. Assisted elbow movements are started by an occupational or physical therapist the day after surgery. Your surgeon will want to check your elbow within five to seven days. Stitches will be removed after 10 to 14 days, though most of your stitches will be absorbed into your body. You may have some discomfort after surgery. You will be given pain medicine to control the discomfort you have. You should keep your elbow elevated above the level of your heart for several days to avoid swelling and throbbing. Keep it propped up on a stack of pillows when sleeping or sitting. How soon will I be able to use my elbow again? A physical or occupational therapist will direct your rehabilitation program. Recovery takes up to three months after elbow replacement surgery. The first few therapy treatments will focus on controlling the pain and swelling from surgery. Heat treatments may be used. Your therapist may also use gentle massage and other types of hands-on treatments to ease muscle spasm and pain. Then you’ll begin gentle range-of-motion exercises. Strengthening exercises are used to give added stability around the elbow joint. You’ll learn ways to lift and carry items in order to do your tasks safely and with the least amount of stress on your elbow joint. As with any surgery, you need to avoid doing too much, too quickly. Some of the exercises you’ll do are designed get your elbow working in ways that are similar to your work tasks and daily activities. Your therapist will help you find ways to do your tasks that don’t put too much stress on your new elbow joint. Before your therapy sessions end, your therapist will teach you a number of ways to avoid future problems. Your therapist’s goal is to help you keep your pain under control, improve your strength and range of motion, and maximize the use of your elbow. When you are well under way, regular visits to the therapist’s office will end. Your therapist will continue to be a resource for you, but you will be in charge of doing exercises as part of an ongoing home program.